On August 19, 1964, the then US President Lyndon B. Johnson established the – National Commission on Technology, Automation, and Economic Progress. He established the Commission in response to growing concern during the deep 1960-61 recession that the unemployment had been created by the pace of technological change. Ring a bell! He wanted to an inquiry to explore this issue and come up with recommendations on how to deal with the possibility that automation was wiping out jobs and the future would be bleak. Before the Commission had reported, the Federal government had reversed its fiscal austerity and the resulting stimulus had driven the unemployment back down to relatively low levels. The Commission noted that unemployment was largely the result of inadequate total spending and that the Government had the tools at its disposal to eliminate it. They considered that there would be workers (low-skill etc) who would suffer more displacement from technology than those with more skill etc, but that ultimately even those workers would be able to get jobs if the public deficit was large enough. In this regard, they eschewed pointless training programs that did not provide immediate access to jobs. Instead, they recommended (among other things) the introduction of a Job Guarantee (Public Service Employment) financed by the Federal government but administered at all levels of government. It would pay the Federal minimum wage and be available on demand. This is the preferred Modern Monetary Theory (MMT) approach and rejects solutions that rely on the provision of a basic income guarantee to resolve the problems created by unemployment. 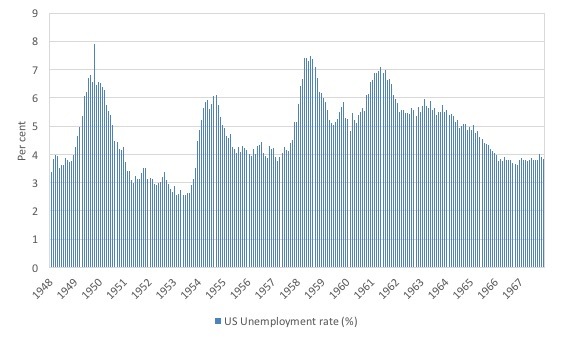 The following graph sets the scene and shows the official US unemployment rate from January 1948 to December 1967. When Johnson took over as President after Kennedy’s assassination on November 22, 1963, the unemployment rate was at the elevated level of 5.7 per cent as the US economy was still struggling to shake off the major recession that began in April 1960 and lasted for 10 months (the trough being recorded in February 1961). Interestingly, the recession was provoked by the central bank hiking interest rates in 1959, but the real damage came when the Federal government shifted from a 2.6 per cent of GDP deficit in 1959 to a 0.1 per cent of GDP surplus in 1960. That surplus was recorded after the Government cut spending (in real terms) by 1.5 per cent cutting spending from 18.2 per cent of GDP to 17.2 per cent of GDP in on fiscal year. Any reasonable person would have known that would have created a recession and it did. In 1962 the deficit was 0.6 per cent of GDP and rose to 1.2 per cent of GDP in 1963, which stimulated growth. By 1962, Federal expenditure was back to 18.2 per cent of GDP, and, surprise, surprise, tax revenue rose on the back of higher economic activity. A tightening of monetary policy in 1959 and the first half of 1960 was followed by an easing of policy in the second half of 1960. There was no fiscal stimulus undertaken. In fact, fiscal policy was tightened at the time, negating the system’s automatic stabilizers and exacerbating the recession. Once the fiscal position was reversed, the US economy entered its second longest period of growth (92 months) in its history. During the 1960-61 recession, it was claimed – as a diversion from the obvious fiscal austerity – that the rising unemployment was the result of new technologies. On February 24, 1961, as the unemployment rate hovered around 6.9 per cent (and would rise the peak of 7.1 per cent in May of that year), the conservative Time Magazine published an article – Business: THE AUTOMATION JOBLESS – which carried the sub-heading “Not Fired, Just Not Hired”. It as a scaremongering exercise which suggested that “automation” was driving “the rise in unemployment”. 1. “The number of jobs lost to more efficient machines”. Ring a bell (hint: ‘the robots are coming’). The article made the obvious point that with productivity growth, “the trend has been to bigger production with a smaller work force”. And it listed the sectors where automation had increased output and reduced the number of workers provided. Many of the losses in factory jobs have been countered by an increase in the service industries or in office jobs. But automation is beginning to move in and eliminate office jobs too. Here was an explicit recognition that engaging in supply-side policies was futile if the demand-side (“a job waiting for them”) was the problem. We now churn unemployed workers, as part of the new industry of mass unemployment created under neoliberalism, through useless and soul-destroying training and compliance programs without any real hope that they will come out the other side with a job. When they do not find work (due to a shortage of overall employment opportunities), the unemployed are further admonished and forced into further ‘programs’. Johnson thus came to office as the recovery was underway but with the on-going automation debate influencing policy discussions (Kennedy had announced widespread re-training policies in his – Special message to Congress on urgent national needs, 25 May 1961. The disturbing trend of the 1950’s has been reversed. Unemployment is no longer growing 10 percent a year as it did from 1952 to 1960. Instead, unemployment is shrinking at an average annual rate of 6.2 percent since 1961. Unemployment is below the 5 percent level because, in the last 4 years, our economy has created more than 4 million new jobs. Note he didn’t talk about unemployment falling because of supply-side measures such as cutting welfare and income support, forcing unemployed workers to run on training treadmill going nowhere and all the other stuff that we hear about endlessly in the current period. This was before Monetarism took hold and, thus, before the neoliberal death grip became dominant. Policy makers knew that if you wanted to reduce unemployment you had to create jobs and that required an increase in aggregate spending from whatever source. What was on Johnson’s mind at the time (among other things) was that structural shifts were occuring in the US economy, which he considered may isolate some workers from the benefits of progress. Technology is creating both new opportunities and new obligations for us-opportunity for greater productivity and progress 0 obligation to be sure that no workingman, no family must pay an unjust price for progress. Note the reference to ensuring inclusion for all (gender specifics – to wit, “workingman” – being an artifact of the times). That progress via productivity growth was on-going but the task of government was to ensure that everybody had a share in that. Compare that to the neoliberal era. This graph shows how stark the shift to the neoliberal has been. It shows average real hourly wages in the US (BLS series CES0600000008 deflated by CPIAUCSL) and Labour productivity (output per hour) (BLS series PRS84006093) from the March-quarter 1947 to the June-quarter 2017, with both series indexed to 100 in the March-quarter 1970. The base year is around the time that Monetarism started to gain prominence in the US and elsewhere and also coincided with the publication of the so-called ‘new labor economics’ literature (Phelps, Lucas etc) that spearheaded the neoliberal putsch. As you can see, it also coincided with the break in the relationship between real wages and labour productivity as legislative and other changes made it harder for workers to share in the growth of labour productivity. Prior to the 1970s, real wages and labour productivity typically moved together. As the attacks on the capacity of workers to secure wage increases intensified, a gap between the two opened and widened. The wage share in national income, which can be calculated from this data, was more or less constant for a long time in many countries during the Post Second World War period and this constancy was so marked that Nicholas Kaldor (the Cambridge economist) termed it one of the great “stylised” facts. It meant that real wages grew in line with productivity growth which was the source of increasing living standards for workers and allowed them to maintain growth in consumption expenditure commensurate with the growing output of the economy. The productivity growth also provided the ‘room’ in the distribution system for workers to enjoy a greater command over real production and thus higher living standards without threatening inflation. To understand the relationship between real wages, productivity growth and the wage share, please read my blog – Declining wage shares undermine growth – for more discussion. In this blog from February 16, 2009 – The origins of the economic crisis – I argued that this break, which was replicated around the world as neoliberal policies gained ascendancy, was one of the early warnings of the GFC. 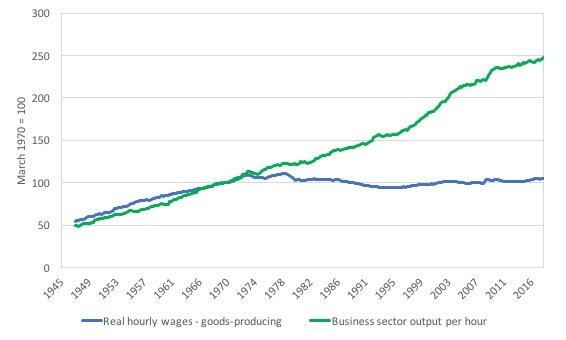 LBJ was clearly operating in the period before this divergence started and knew that real wages growth would track productivity growth and that workers would thus share in the output efficiency gains made possible by new technology. If we understand it, if we plan for it, if we apply it well, automation will not be a job destroyer or a family displaced. Instead, it can remove dullness from the work of man and provide him with more than man has ever had before. So rather than spinning the ‘robots are coming to take your jobs’ and therefore we must have a basic income policy, LBJ governed in a time when planning ahead was not a dirty word and everything was not left in the hands of the amorphous market. The National Commission on Technology, Automation, and Economic Progress presented their final report to the President and the US Congress in February 1966 – so it met in “monthly 2-day sessions” from January 1965. You can access Volume 1 of the Report Technology and the American Economy – HERE. By the time the Commission delivered its Report, the US unemployment rate had fallen to 3.8 per cent on the back of the fiscal stimulus making a mockery of the ‘national emergency’ discussions that arose in relation to automation during the 1960-61 recession. It was evident that automation was not the problem that had created the unemployment at the beginning of the decade. The relatively high postwar labor productivity, much of it due to technological change, combined with the current and future high rate of labor force growth increases dramatically the number of jobs which must be created continually to achieve and maintain full employment. This is in contradistinction with the current period where labour productivity growth does not appear to be fast enough to justify the hypothesis that there is widespread robot innovation replacing jobs. Further, labour force growth around the world (advanced nations) is much slower than it was in the early 1960s. Taken together, it is much easier to maintain full employment now than it was then. Technology is not a vessel people are to be poured and to which they must be molded. It is something to be adapted to the needs of man and to the furtherance of human ends, including the enrichment personality and environment. Once again, stressing that these issues/challenges are choices that we make and there are always alternative paths to take. The best path is the one that advances the well-being of society rather than feathers the nest of the capitalist class. This was a different time indeed. No basic income sell out envisaged here! Chapter Two considered “Technological Change and Unemployment”. We believe that the general level of unemployment must be distinguished from the displacement of particular workers at particular time and places, if the relation between technological change and unemployment is to be clearly understood. The persistence of a high general level of unemployment in the years following the Korean war was not the result of accelerated technological progress. Its cause was interaction between rising productivity, labor force growth, and an inadequate response of aggregate demand. This is firmly supported by the response of the economy to the expansionary fiscal policy of the last 5 years. Technological change on the other hand, has been a major factor in the displacement and temporary unemployment of particular workers. Thus technological change (along with other forms of economic change) is an important determinant of the precise places, industries, and people affected by unemployment. But the general level of demand for goods and services is by far the most important factor determining how many are affected, how long they stay unemployed, and how hard it is for new entrants to the labor market to find jobs. The basic fact is that technology eliminates jobs, not work. It is the continuous obligation of economic policy to match increases in productive potential with increases in purchasing power and demand. Otherwise the potential created by technical progress runs to waste in idle capacity, unemployment, and deprivation. Which sums up the Modern Monetary Theory (MMT) approach to this question and to the ‘robots are coming’ ruses. The currency-issuing government has the responsibility of maintaining aggregate spending at a level sufficient to generate sufficient jobs overall. This level changes as the pace of labour force growth and productivity changes. But the fact remains – the government can always purchase anything that is for sale in the currency it issues, including all idle labour. There is never a reason for persistent mass unemployment. Mass unemployment is a political choice not a financial necessity. Please read my blog – The full employment fiscal deficit condition – for more discussion on this point. Technological change will alter the type of jobs and the sectors and regions in which they are created by the non-government sector (in particular). The clear relation between spending, income and job creation is emphasised. Proponents of basic income guarantees conflate the concept of jobs with work. They claim that robots etc will eliminate work, when in fact, as the Report noted “technology eliminates jobs, not work”. As the nature and type of jobs change, as they have done since we have been keeping records, the need for productive work remains. That insight is important in understanding why MMTers advocate the Job Guarantee, which rewards work rather than a basic income guarantee (BIG). The Report provided a detailed sector-by-sector analysis of the impact of technological change on productivity and employment shifts. It concluded that despite on-going technological change, “Most industries … have registered substantial increases in employment” as a result of bouyant aggregate demand conditions. Technology shifted where the jobs were and was a “major source of occupational displacement” (p.20) but overall spending was strong enough to more than offset those effects. … all levels of government … [could] … facilitate occupational adjustment and geographical mobility … and to … share the costs and help prevent and alleviate the adverse impact of change on displaced workers. They emphasise that the “accompanying burdens and benefit should be distributed fairly” (p.33). 2. For those less able to compete in the labor market, productive employment opportunities adapted to their abilities should be publicly provided. 3. Under the best of circumstances, there will be some who cannot or should not participate in the job economy. For them, we believe there should be an adequate system of income maintenance, guaranteeing a floor of income at an acceptable level. In other words, a Job Guarantee system for workers who are unable to find a job but are willing and able to work. And ongoing income support for those who are unable to work. This is the MMT position expressed in 1966. … the most important condition for a successful adjustment to technological change is an adequate level of total income and employment. We recognise this is not the end of economic policy, but we are confident it is the beginning … 1964 has clearly demonstrated that Federal fiscal and monetary policy can bridge the gap between the current level of private spending and the level of total demand needed to reduce unemployment. During the life of the Commission the very groups disproportionately burdened by unemployment – the young and inexperienced, the undereducated, the unskilled, Negroes, production workers – have profited more than proportionally from the healthy growth of total employment. And, “the toleration of unnecessary unemployment is a very costly way to police inflation”. Again, this is the MMT position – using unemployed buffer stocks is a vastly inferior way to maintain price stability when compared to the use of employment buffer stocks. The former method of maintaining price level stability is the current dominant orthodoxy. It has delivered massive costs and few benefits. … unemployment to the minimum amount necessary for the smooth functioning of the … labor market. They were “not impressed with a 4-percent unemployment rate, or a 3-percent, or any other unemployment rate, as an ultimate goal of economic policy (p.35). They wanted governments to push to the irreducible minimum unemployment rate consistent with people moving between jobs only. And this was the justification for recommending “public service employment”, for which the “major resources must come from the Federal Government but the jobs need not”. Were it not for the endemic financial stringency at those levels of government, the employment might already have been provided. They then described in some detail how these jobs could be designed, the need to “treat the new employees as regular employees”, the need to pay the “Federal minimum wage” and the possibility of including training ladders as part of the public sector jobs. The principle conclusions and recommendations of the Report are provided in Chapter Ten. 1. “The excessive unemployment following the Korean War … was the result of an economic growth rate too slow to offset the combined impact of productivity increase … and a growing labor force” – that is, deficient aggregate spending. 3. “Education … determines the employability and productivity of the individual, the adaptability of the labor force, the growth and vitality of the economy, and the quality of society. But we need not await the slow process of education to solve the problem of unemployment”. 5. “The needs of our society provide ample opportunities to fulfil the promise of the Employment Act of 1946: ‘a job for all those able, willing, and seeking to work’. We recommend a program of public service employment, providing, in effect, that government be an employer of last resort, providing work for the ‘hard-core unemployed’ in useful community enterprises” – in other words, a Job Guarantee. 6. “We recommend the now federally financed but State-administered employment services be made wholly Federal”. They went on to discuss education strategies and other types of assistance. But their key recommendation was that a Job Guarantee could always improve the circumstances of workers unable to get work while longer term policies that expanded skills via education and training had time to work. This is a very interesting Report. The obvious retort from those who continue to think there will not be enough jobs is that the Report was written in the 1960s and the type and pace of technological change now is vastly different. I beg to disagree and I will write more about that another day. And, a Job Guarantee can always provide productive jobs to the most disadvantaged worker who has been displaced. And, finally, on automation and robots, I thought this article in The Atlantic was interesting (January 30, 2017) – The Booming Demand for Commercial Drone Pilots. The hype in the field of robotics has been around for over 50 years. It is unrelenting. And few, like this blog post and the LBJ report, that distinguish between the meanings of the terms, ‘work’ and ‘job’. They are not coterminous. Not distinguishing between them facilitates a good deal of socially deleterious equivocation. That it was easier to reduce unemployment during the time of the Report is possibly due, at least in part, to the different currency systems used then, Bretton Woods fixed, and now, fiat. LGJ was wrecked by the Vietnam War and Robert Kennedy’s nefarious machinations. I should have said ‘fiat floating’. I have always thought that the robot apocalypse idea fishy. Sometimes I go to reddit Lost Generation to see how some people of my generation are doing. These robot apocalypse articles pop up quite often. Somehow, more tools, higher efficiency, and more free time for citizens –> worst outcomes for citizens. Makes sense. Then again, in the neoliberal world, everything is upside down. Have you guys read the new poll of Americans’ view on socialism and communism? 60 percent millennial say they would rather live in socialist/communist system than capitalism. But would changing the system solve the problem of junk economics’ inadequacies in addressing change, as this article demonstrates? More people need to realize that mainstream economics is junk. I’m not against a job guarantee. What I’m against is not integrating both a job guarantee and a universal dividend into economic policy so as to better and more completely end Finance’s monopolistic paradigm of Debt Only, and I’m surprised at your fighting against such integration. Great topic. When one realises the many levers govts can pull including its fiscal policy and job guarantee, one can see how corupt govt has become. I believe its a copout to just blame neoliberalism, to do so will ignore the role of govt corruption. Govts have lied to students in economic courses and have covered over the statistics by changing the way they are calculated. If our cost of living was reduced, workers could survive well enough on smaller hours, freeing time for family etc. If govts used their deficit ability to employ people in caring roles, many positions could be created. When one realises govts can create jobs that add community value and not just private industry profits- then one realises how corrupt our govts have been and that it is not just a fault of ‘neoliberalism’. Good reading Prof Bill. Ever been to a hacker event? I went last summer to SHA2017 (Still Hacking Anyway) in NL to do some research for ideas I’m having, and it was quite a disturbing and exhilarating eyeopener. This community is tolerant, ethical, innovative and has an astounding awareness of the issues of the present and future. So, at the end of this year I will attend the Chaos Computer Congres in Leipzig to explore these ideas further. Now, these hacker events are conferences on technology, society and utopia. There are lectures and workshops and various events on a multitude of topics including (but not limited to) information technology and generally a critical-creative attitude towards technology and the discussion about the effects of technological advances on society. It appreciates all kinds of participation, and everybody is encouraged to contribute by volunteering, setting up and hosting hands-on and self-organized events or presenting your own projects to fellow hackers. Still anyway, it made me realize that there is a lot of work to do now, like really now …., not to mention in the future. For example, everyday digital products are released on the market without being thoroughly tested on what impact (in the broadest sense) they are having on us, and thus, society. So, we need people with skills and certainly not those who write about automation or robots without having a clue what they are writing about. Obviously, capitalists are not at these events, but people who question society’s values like artists, creatives, geniuses, and criminals… you know, the real change makers. Planning to do a MMT talk which connects with Bitcoin/cryptocurrency shemes. The JG should not be the answer to automation – surely if we focus on education and training, workers will not want to spend their days tightening nuts on an assembly line. If technically trained they will be manufacturing, servicing, selling, etc robots; engineers will be designing and programming robots. Its a matter of governments making sure that we dont just allow foreign interests to take all these jobs which seems as if this is where they are going. What I have noticed is that there was a shift in the productivity of the world economies after about 1970 and maybe as early as 1965. [Gail Tverberg]. Our economic productivity peaked at about the era of the successful moon shots and has been declining ever since. It will never recover. Without the smarts to process the data relating to all that I am unable to give a figure in dollars. Someone else can do that. But it seems to me that the neo-liberal era, which began its inroads into the economic debate about then were directly linked to the decline in total productivity etc. This decline is structural because the energy needed for our economy to function has been getting more expensive with each passing year and it passed a tipping point at around this time. In other words the neo-liberal era was not an event from nowhere but had a structural cause. Productivity doesn’t grow economies any longer, it credit fuelling asset inflation etc. The economy is after all not a monetary construct, but a surplus energy system. Rob, the nature of JG jobs is that they are jobs that are needed but not met by the market. That won’t change with any amount of automation. And if it ever gets out of hand the government can simply make laws limiting or even banning robots/AI outright, as some states have done regarding ticket-purchasing bots, for example. Steven Hummel: I’m not sure how long you have been following Bill’s blog, but the JG he describes results in a universal social dividend (albeit non monetary) in the form of socially valuable work being performed by otherwise unemployed people. We all benefit from whatever the formerly unemployed are able to deliver. In more progressive times there had also been a universal social dividend arising from public ownership of infrastructure, utilities etc.. The financial sector itself benefits only in a monetary way from it’s activities. There is nothing delivered to society in terms of a real dividend. Part of the neo-liberal fraud is that money is “a veil over barter”. We live in a fundamentally monetary economy and to insist upon a JG Only as the solution is to refuse to integrate truths and so not recognize the full pattern (paradigm) of both the problem and its solution. Advocating both a JG and a universal dividend accomplishes that integration and also opens up a better understanding and expression of the major insight of MMT itself which is that the money system is fundamentally distributive in nature, and with the proper directly distributive policies would be distributive in fact. Larry:That it was easier to reduce unemployment during the time of the Report is possibly due, at least in part, to the different currency systems used then, Bretton Woods fixed, and now, fiat. Bill & MMT says the opposite, and although I like to be disagreeable, I can’t disagree (with them). It is much, much easier to reduce unemployment now, because of floating fiat rather than Bretton Woods fixed. The thing is that people have to decide to do it & polities have to be healthy enough for politicians to respect their decisions – as is the case in the UK, happily and not the case in Greece, unhappily. Steven Hummel: the major insight of MMT itself which is that the money system is fundamentally distributive in nature, and with the proper directly distributive policies would be distributive in fact. Although the meaning is not clear, this seems yet more contrary to the MMT view. MMT analyzes modern “monetary production economies”, where money and finance is involved in production and distribution, where full employment and fair distribution doesn’t happen by magic, as in alternative theories, whether they call themselves “left” or “right”. The paramount insight of MMT is the JG. It involves both production (work) and distribution (money). Universal dividends, basic income etc are fatally flawed because of their focus on one – as if it could occur as a general principle, could mean anything, without the other. From its title MMT is about money. What I meant by MMT’s major insight being that fiat money systems are distributive in nature derives from Mosler’s insight that taxes are rubbished. Hence money can be created and distributed for any purpose a sovereign nation wants to…..without re-distributive taxation at all. The trick of course is how to have much better monetary democracy (a universal dividend), prevent inflation and end private finance’s virtual monopoly on credit creation (my innovation of extending Social Credit’s mere retail discount policy to the point of sale within and throughout the entire process of the economy). Within those two policies one could easily fit a JG for anyone wanting/requiring a job because they couldn’t seem to find purpose without one. With a sufficient dividend and point of sale discount there would be enough demand continually available to insure a lot better investment climate and hence a lot more employment than we have with the idiocies of neo-liberal austerity. Furthermore, with a sufficiently high dividend and high enough point of sale discount percentage one could live a life of leisure (leisure is self chosen attentive activity not idleness) without working and hence capital would not have “the reserve army of the unemployed” to dominate and manipulate anymore. Steve Hummel- People don’t get jobs because they “couldn’t seem to find purpose without one”. People get jobs because they want money. Both taxation and spending are (“re”)”distributive” by their very nature. The taxed lose money, the spent-on get it. The trick is the rational design of what each gets or gives in return. J Christensen’s point is of the utmost importance. MMT is for universal, social dividends – but not monetary ones, which cannot work, thankfully. Universal (monetary) dividends, basic income etc are worthless, stupid ideas that just make things (much) worse. The only thing worse than the repulsive fantasy of “a life of leisure … without working” supported by a “sufficiently high dividend” – in money used to purchase the labor of others – is the reality. There’s a name for that system: Slavery. Explain how they would not work please. Monetary policy will work if its directly to the individual and also if it is tied directly and reciprocally to the pricing system, that is to the point of sale within and throughout the entire economic process. If you step back and look at central bank operations that attempt to keep the money supply, inflation, interest rates, etc. etc. etc. in reasonable balance it becomes more clear to you how complex the system has become, and also how such operations perfectly reflect how the Ptolemaic astronomical paradigm introduced “epicycles” into their thinking in order to explain anomalies….and yet still failed to resolve them. We are so overdue for a new monetary and economic paradigm instead of continually trying to tweak theory and pursue incremental reform. Consult Wisdom and History. I fail to see how providing the means of economic freedom (a sufficiently high universal dividend) and the point of sale discount policy I related can be transformed into slavery. I also do not understand why integrating BOTH a dividend and discount policy AND a JG as well….is inferior to a JG only. I’m sorry, but exclusionary thinking smacks of orthodoxy which is something I thought we were trying to overcome. Output of work is morally owned by the workers. If they are giving up X hours a day to make stuff you need, then you have to give up X hours a day in service of others. Otherwise they will feel they are being robbed and agitate to have it stopped. The value of currency is what it takes to get hold of it. Which makes free money from the state worthless in real terms. If you want the production workers to work all week, you need to do something real in return. Otherwise they’ll just make enough for themselves and take Friday off. Steven Hummel, there might not be much of a problem with a “universal dividend” if it was in fact a “dividend”- meaning it comes from profits due to and from prior investment. In that case it would probably be a fairly small income since the profit share of income in the US economy (for example) is not a very large share of total income. The main problem with it might be that the private sector decides they would rather not make investments in production if their reward for that is going to be divided amongst all the people in the universe (and therefore very small). Why bother risking your assets making investments if the potential reward can’t come close to the risk of losing your assets? And the income for someone relying on a universal “dividend” is no way going to provide a sufficient income for those people to experience “economic freedom”. Unless you mean they will be free to sleep under bridges. But we are already free to do that in the US. But suppose you really are talking about a basic income guarantee, where the government credits everyone enough money so that they can live a decent life without working if they want to go through life that way. There are a number of problems with that- both political and economic. Economically speaking, the people not working will be depending on the people who are out there producing the things they need so that they can pretend to have “economic freedom”. Those people they depend on are called workers. Politically, those who are working are probably going to get tired of having an increasing share of their output go to large numbers of people who could also be contributing but are not. When enough of the workers get tired supporting non-workers and figure out they might as well not work either, the political problem creates another economic problem- decreased output. If they are somehow prohibited from quitting their productive jobs then that is somewhat similar to slavery of a sort. As to a program that had both a Job Guarantee and some sort of income supplement, I don’t have a problem with that as long as the income supplement depended on the state of the economy. As in when there was a recession it could be higher, and when there was very low unemployment it would be much lower. But a variable income supplement is no basic income guarantee that could be lived on reliably. I fail to see how providing the means of economic freedom (a sufficiently high universal dividend) and the point of sale discount policy I related can be transformed into slavery. Thanks Neil & Jerry. The income guarantee part doesn’t really require transformation, it is basically slavery already. The people who do the work paid for by the SHUD are enslaved to the inept social engineers and the recipients of the dividend. That’s the way it has always worked out. Petrostates with tiers of citizenship are the prime real example of income guarantee proposals and most people don’t think they are very pretty overall. Income guarantees are either just another name for “welfare” in which case every MMTer I know of is for them, or a joke amount, or insanely inflationary and thus a joke. Guaranteed income is like a proposal to abolish slavery – by making everyone a master. Most children can see through it. It takes major “education” in “economics” and massive confusion, false distinctions and dissociation of “technical” terms from their real world interpretation to convince oneself that income guarantees could ever work. The JG is the grown up reality proposal. People will sometimes work for others, sometimes have others work for them. That’s called “one hand washes the other” or playing well with others. It is how the world has worked and progressed. A JG just means that nobody will be excluded from this, just so some saboteurs can become relatively richer and tyrannical. Guaranteed income is also based on a very blinkered view and unstable conception of “economic freedom” – the freedom to do nothing, the freedom to order other people. What Bill calls being a “consumption unit”. But never the real freedom for everyone to actually do things theirselves. It is quite contrary to the mainstream of ethical thought East or West over the millennia, which considers exclusive obedience to ones desires of the sort a guaranteed income satisfies a form of slavery, and esteems the freedom to actually do stuff as a realer freedom. Sorry, but that post was a lot of thinking inside the present paradigm and no actual looking at the policy I mentioned…..which is outside of it. New paradigms are always considered absurd by most….right until they become the new general truth. Consult history and Thomas Kuhn’s book on the subject. You guys can continue to be self righteously exclusionary by demanding that a JG ALONE is the answer, which is the signature of all rigid orthodoxies, I’ll continue to advocate an integration of both into the system which (integration) is the signature of wisdom, open mindedness and hence the antithesis of orthodoxy.